For a tiny country, Panama offers a lot of choice—city living, mountain hamlets, and more beaches that you might realize. Despite having both a Pacific and Caribbean coast, a host of affordable flights from the U.S., and stellar infrastructure, Panama’s beaches aren’t overrun by big resorts. Each little beach town has its own personality, so no matter your taste or budget, you’ll find a beach town to suit you. The climate in Coronado, Panama is excellent with just 69 inches of rain a year. Just an hour’s drive west of the nation’s capital, on the Pacific Coast, you’ll find the beach town that’s favored by expats. Once a weekend home destination for wealthy Panamanians, Coronado has grown into a thriving hub in recent years. The climate is one of the biggest draws. Coronado is located in the region known as the Arco Seco, or the “Dry Arc,” which means the town averages just 69 inches of rain a year. Its unusual beach—a mix of white and black volcanic sand, which twinkles in the sunshine like diamonds—is certainly eye-catching, too. The beach is quiet, clean, and uncrowded…just in case relaxing is the only thing on your mind. But there’s more to the town than just sand and sun. Within that thriving expat community, there are countless opportunities to socialize and to be active. There are a range of local and European restaurants in close proximity as are shops, restaurants, big-name supermarkets, banks, and so on. Granted, Coronado is not the least expensive destination in Panama. A single expat or a couple should budget about $2,500 a month to live well here…including rent. 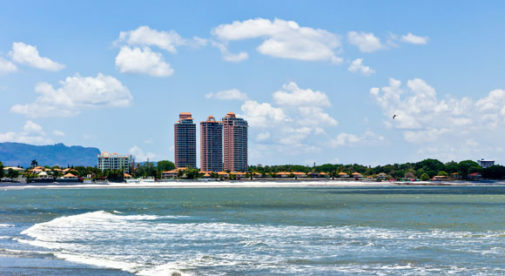 But given the quality of life and everything Coronado has to offer, it’s excellent value—especially considering how much you’d spend to live in a comparable town in, say, California. In Bocas del Toro you can sit and enjoy a beer for as little as a dollar while you take in the breathtaking scenery. There’s no denying the beauty of the Bocas del Toro region. Part of it is an archipelago, which offers hundreds of Caribbean islands for you to explore. At about seven hours by car from Panama City, it’s just about the farthest you can get from the capital without stumbling into neighboring Costa Rica, but domestic flights run to and fro daily and are only an hour long. So Panama’s most “remote” expat destination really isn’t remote at all! 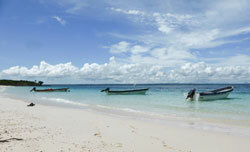 The provincial capital is on Isla Colon, an island dotted with pristine beaches overlooking turquoise-hued water. Sea turtles come here to lay their eggs and maroon starfish seem to dance in sunlight refracted by the ocean’s waves. Hop over to the other islands (some just minutes away via water taxi), and it only gets better. There you’ll find gentle waters of the palest blue imaginable. Bright-green palms sprout from amongst tufts of rainforest foliage. Bocatoreños (the people of Bocas) are easy-going, with easy smiles and a lilting cadence to their Spanish. Or English…many of them speak both, in a nod to the population’s strong Afro-Antillean roots. It’s one of the reasons why so many expats feel comfortable here. Because it’s a popular place with tourists, happy hours abound, so you can chill with a beer for as little as a dollar. Seafood is on every menu and you can eat well for $10 to $30. Homes to rent are readily available and very inexpensive compared to more popular Caribbean destinations. Budget from $500 a month for a small place or between $600 and $900 a month for a three-bedroom, two-bathroom home. All in, a couple could live well here for $1,200 to $2,000 a month. The beaches in Pedasi feature water as clear as bathwater and are surrounded by lush tropical foliage. Almost in the middle of the squiggle that is the Isthmus of Panama, you’ll find the vast Azuero peninsula. This Pacific Coast region boasts more traditional festivals than any other. I enjoy all these aspects of Panamanian culture, as they’re fun, colorful, and so different from other Latin American traditions—Panama’s national dress, tipico music, and folkloric dances are proudly preserved here. But, Azuero has much more to offer than parties and parades—not least some stunning beaches. And it’s the least expensive region of Panama…the kind of place where a single expat or a couple could easily live on just $1,000 a month excluding rent. 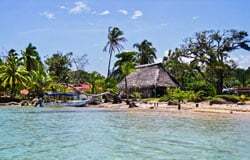 The pristine beaches on its eastern coast have begun to attract a steady trickle of expats, many of whom have chosen to live in Pedasi. Homes with traditional red roofs and tiled terraces line the one main strip of the town. A nearby plaza is graced with a tiny white church and a small gazebo. The greater Pedasi region offers some good fishing, too, if that’s a hobby for you. Even the unluckiest of anglers can catch succulent tuna, wahoo, dorado…the list is extensive. The region’s many beaches are surrounded by lush tropical foliage. The ocean here is warm, not frigid, and as clear as bathwater. National parks in Azuero help preserve the diverse eco-system and make for amazing day trips. One of my favorites is beautiful Iguana Island. With so much to offer, it’s no wonder a friendly, lively expat community has begun to grow in Pedasi. Newcomers are welcomed and shown the ropes by “old-timers” who’ve been around a while…including where to find those $600 a month homes for rent and which restaurants serve $3 lunches.